Swedish Ambassador visited the Gustavus campus on Monday morning. The Swedish Ambassador to the United States, Karin Olofsdotter, visited Gustavus earlier this week. The visit was put together and planned by Senior Director of Institutional Events in Marketing and Communication and Gustavus alumni Barb Larson Taylor. “We were asked in August if we would be willing to have the Ambassador visit,” Taylor said. Gustavus of course accepted the offer. “Ambassador Olofsdotter has not been to campus before. I believe the last visit by an ambassador from Sweden was in 2010 by Ambassador Jonas Hafstrom,” Taylor said. Gustavus, as a college founded by Swedish settlers and named after a former Swedish King, is a natural destination for Swedish officials. “Ambassador Olofsdotter, has served for one year as Sweden’s ambassador to the United States. She joined the Swedish Foreign Service in 1994, and her first foreign posting was in Moscow. Then back in Stockholm, Ambassador Olofsdotter served as Chief of Staff to three successive Swedish foreign ministers. From 2008 to 2011, Olofsdotter was Minister-Counselor and Deputy Chief of Mission at the Swedish Embassy in Washington, D.C. Her first ambassadorship was in Hungary from 2011 to 2014. Returning to Stockholm, she was deputy director general for trade at the Ministry for Foreign Affairs, and in 2016 she was promoted to director-general for trade.” The ambassador’s biography states. Olofsdotter is thoroughly experienced in working for her government. The Swedish citizens have sent an ambassador to the United States since 1812. The ambassador recently had an election which made her the first female Swedish ambassador to the United States. “She (Ambassador Olofsdotter) was interested in presenting information to audiences about Sweden and to broaden and deepen Americans’ understanding of Sweden, both its domestic circumstances and Sweden’s view of global issues. At the same time, she was interested in learning more about America, so that she can be a better interpreter of American attitudes in her reports back to Sweden,” Director Taylor said. 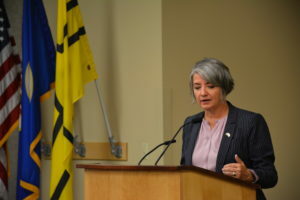 Olofsdotter was on a visit to Minnesota as part of her duties as Sweden’s ambassador to the U.S. Her stay at Gustavus was a half day long and included the meeting, lunch, and a tour of campus. The stopover was put together by Taylor, but was hosted by President Bergman. “The ambassador enjoyed her day on campus. In particular, she was impressed with the questions from the students and with their knowledge of Sweden. She found the campus to be lovely and looks forward to ways the Swedish Embassy in Washington D.C. may continue to be in contact with the Gustavus community,” Director Taylor said. This could mean big things for Gustavus. There may be more events tying the Swedish Government to Gustavus Adolphus College in the future. Many students were in attendance for the meeting with the ambassador. “It was really interesting to hear the opinion of a European Ambassador on America’s position on immigration. It was also interesting to hear what she had to say about Sweden and America’s relationship,” First-year student Peter Neuman said. There were also many other classes that attended the meeting. At one point in the meeting, an unidentified non-Gustavus student asked a question that shook the room. He brought up the idea that Sweden is losing its identity due to the large amounts of immigrants the country has been taking in from countries in the Middle East such as Syria and asked the ambassador to comment on it. “I think it was inappropriate for him to ask the Swedish Ambassador a racist question like that. He took away time that could have been used for students to ask questions. However, the ambassador responded really well. She said it’s not a problem and that she is not worried about Sweden losing its identity,” Neuman said. Students and other attendees of the meeting were able to take pictures with ambassador Olofsdotter and ask final questions after the meeting. The ambassador was pleasant and responded to all questions asked. She seemed very confident and experienced in her job as ambassador. After her visit to Gustavus ,the ambassador visited the Twin Cities to meet with Governor Mark Dayton. She discussed topics similar to ones from her visit to campus. Olofsdotter then left Minnesota on Wednesday to return to the Swedish Embassy in Washington D.C.